For the New Year I told myself that I’d drink more water, snack healthier and add probiotics back into my diet. I used to take probiotics and Izzy did as a baby also. They helped her be more regular and reduced any digestion upset as her tummy got use to breaking down breastmilk and then new foods. That’s right, you can literally dump the packet right onto your tongue! They are super quick melting & delicious. Remember those pixi stick candies? So much fun right? That’s what it’s like! Probiotics are good bacteria, that help keep your gut happy and healthy. They also can help your little from having unexpected diarrhea. Beyond digestive support they can help support your immune system as well. 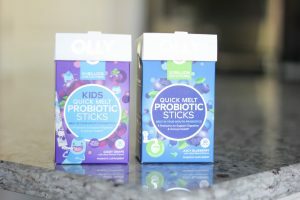 I keep OLLY quick melt probiotic sticks in my diaper bag because they are a yummy treat and perfect for on the go. You don’t even need water to mix with them. Tear open and dump them right onto your tongue. Seriously perfect for me because we are always busy and there is that mom brain thing too. 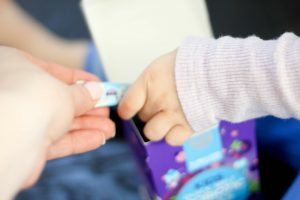 Having them in my diaper bag allows me to easily pull them out and be sure we are both getting our probiotics daily. 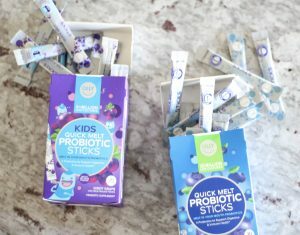 Did you know each kids probiotic stick is filled with 5.5 billion live cultures from a blend of three scientifically researched strains? Also each adult probiotic stick is packed with 10 billion live cultures from four scientifically studied strains. Click here & snag a free taste! That’s awesome that you don’t need water! I’ll have to check these out! These are good to know about! My oldest struggles with constipation, and probiotics seem to be the only thing that helps! Oh he’s going to love these!! I’ve never tried Olly but you’ve sold me. I’m going to give these a try! I love that they are so easy and delicious!!! I NEED these- I had to give up my probiotic because it was dairy based and now I can’t handle dairy. Definitely checking this out! I have never tried this! Now I must! these look awesome, and I love that they have them for kids! I’ve seen them around, so i may just pick up a box the next time i’m at the store! 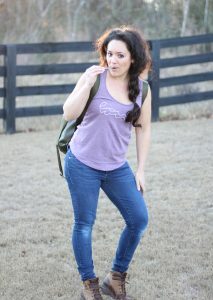 Obsessed with your bag omg. Couldn’t agree more it’s so easy to take on the go. Plus they are seriously so tasty. My kids love it! I’ve really got to get on the probiotics bandwagon!